Imagine never stepping foot in a country before you decide to live there for four years. Now imagine that everyone in that country speaks a different language than you. Then imagine being all alone in that place while the rest of your family resides halfway across the world. 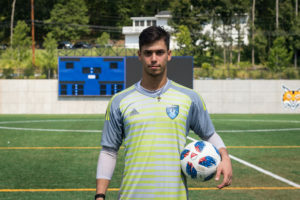 That’s the situation that Quinnipiac men’s soccer junior goalkeeper Chrysostomos Iakovidis found himself in just over two years ago. Iakovidis, a native of Thessaloniki, Greece, has always been in love with the game, despite his family history. So, if his entire family played volleyball, what drew Iakovidis to the soccer pitch? Iakovidis first stepped on a soccer field when he was just three years old – the rest is history. He began playing with the Greek club Aris Thessaloniki FC in 2010 at age 12, and didn’t leave until 2016, when he came to Hamden. During those six years, Iakovidis also suited up for the Greek under-16 and under-17 national teams, participating in the European Qualifiers and European Championships. Despite all this time playing soccer at a high level, Iakovidis wasn’t focused on leaving his native country to pursue American opportunities. He just didn’t think it was realistic. All of this experience led Iakovidis to a showcase tournament in England where college coaches from America were in attendance. Quinnipiac head coach Eric Da Costa, as you might’ve guessed, was one of them. Da Costa knows this process all too well. His 2018 team consists of 10 international players and he has been an avid recruiter overseas since he was named head coach 14 years ago. University coaches learn about certain international talents through different recruiting services, Da Costa claimed. Each country has different groups focused on exposing their players that want to play in America. As for the trips overseas, Da Costa is all alone. It’s a simple business trip each time he flies over the pond. 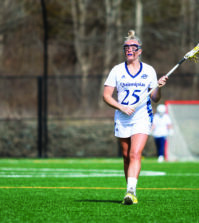 That sort of one-on-one connection is part of what gravitated Iakovidis toward choosing Quinnipiac over other potential suitors. Iakovidis got his wish in August of 2016 when he officially starting living in America. That year was his first in the U.S., and he had to immediately balance school, soccer and social life in a foreign nation at just 18 years old. The language and school aspect were the biggest challenges, as one might imagine. While he might’ve had troubles with communication off the field, on the field was a different story. From the get-go, Iakovidis was a force in net. He started 17 of 20 games for the Bobcats, posting a 12-5 record and recording 75 saves for an .806 save percentage. He also had seven clean sheets, or shutouts. “One thing I know for sure is that the soccer part is easy,” Da Costa said. “It’s a universal language. There’s a common bond there immediately amongst teammates. You walk into a brotherhood and a family and those comforts make it easy for you to play and perform. “It’s everything else – dorm life, social life, academic life – that’s the hard part, that’s where we’re really fortunate to have so many guys that are able to help these guys make that adjustment. One of the many things that international students have to deal with is finding places to go for breaks, whether it be for Christmas or Thanksgiving, or even just a long weekend. Da Costa said he often tries to invite his international players over for dinner, but that by the time he asks they are already on their way out of town – not to go home, but to go to a teammate’s house. “That’s a really special culture that we have in our program that I’m really, really proud of – more than all the wins, more than all the championships, more than all of that,” Da Costa said. Iakovidis continued his rise during his sophomore campaign in 2017, when the goalkeeper started all 19 games and again recorded seven shutouts. After allowing four goals in the season opener at Boston College, he went 18 consecutive games allowing two goals or less. That’s the definition of locked in. 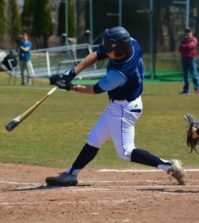 Now an upperclassman, Iakovidis is starting to think about life after Quinnipiac. He and his coach have differing views on where he might end up, but both know it will involve soccer. Da Costa is thinking Iakovidis stays in the States, but how does the Greek feel about it? Now, let’s bring this full-circle. Imagine moving to a foreign country for four years, learning the language on the fly…and then considering wanting to stay there for your career?